Welcome to Prepaid Phone News' regular Sunday Prepaid Phones on Sale this Week feature listing all the best US prepaid phone deals in one place. My Deal of the week pick is the AT&T Nokia Lumia 635 LTE Windows Phone for $79.99 at Frys or $89.99 at RadioShack. 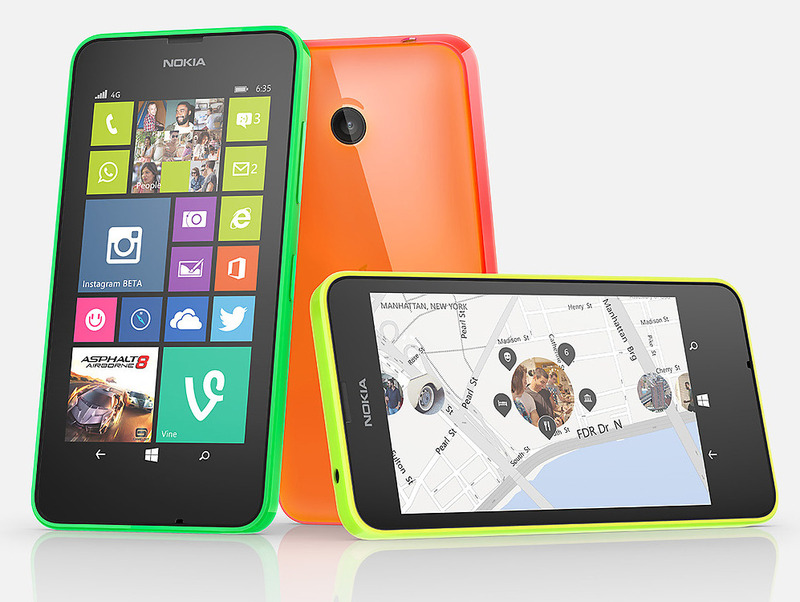 The 635 is the successor (and a significant upgrade) to the popular Lumia 520. It features LTE support, a 4.5 inch 480 x 854 pixel Gorilla Glass screen, quad-core 1.2 Ghz Snapdragon 400 processor and a 5MP autofocus camera. It runs the just released Windows Phone OS 8.1. Virgin Mobile LG Optimus F3 LTE Android phone for $39.99 (reg $129.99) at BestBuy. Virgin Mobile HTC Desire 816 LTE Android Phablet $199.95 at ShopCellDeals. All the best current prepaid phone deals: (Except as noted all are available both online and in stores). Amazon (online only) Free shipping on orders over $35 unless otherwise noted. AT&T GoPhone (online only) free shipping on all phones and $5-$30 online-only discounts on most phones. Boost Mobile free shipping on all phones. Cricket free shipping and free activation on all phones. Pay on time for one year and get a $50 account credit towards a new phone. Phones listed below are all "New Cricket" GSM phones that use the AT&T network. ZTE Grand X $149.99, $99.99 after $50 mail in rebate for new customers. 50% off Moto X (2013) and Droid cases, 25% off screen protectors. NET10 (online only) Free shipping of all SIMs and phones priced at $19.99 or more. Not all phones are available in all areas. Free month of service for porting your number to PTel from most carriers. See Two Free Months of Unlimited Service For Porting Your Number to PTel for details. RadioShack Shipping $6.99 Free ground shipping on orders over $50. Free Ship to Store. Straight Talk (online only) Free shipping on phones $29.99 and up. Not all phones available in all markets. Apple iPhone 5 16 GB (Verizon) Android phone $400.00 (was $550. Target free shipping on orders over $50. 5% off and free shipping on all orders with Target Red Card. T-Mobile (online only) Shipping is free on all phones and SIMs. Tracfone (online only) Free shipping on orders of $19.99 or more. Not all phones available in all markets. Use promo code FRIEND1 to get $5 off any phone or phone plus airtime bundle priced at $9.99 or higher. Verizon Online only. Free overnight shipping, free activation on monthly plans. Virgin Mobile free shipping on all devices. Walmart Free shipping on orders over $50, $4.97 otherwise. Free ship to store. Updated 9/5 New Frys and Virgin Mobile Deals deals. Still no camera flash on the Nokia? Is there any Nokia that is an Android? I love Nokia but not windows. Only the Nokia X, X2 and XL. They run a custom version of open source Android without Google apps. They weren't made for the US market and don't support US 3G. Microsoft has announced that they are discontinuing the Nokia X series.
" I love Nokia but not windows." Nokia has a very close business relationship with Microsoft at this time. It has resulted in Nokia phone sales soaring. I doubt we will ever see Nokia Android/etc phones for the time being, as long as this is successful. And Dennis has explained the X,X2,XL which are apparently "legacy" Android phones, with no future for this line. Thank you Dennis for a Deal of the week phone that runs on a network that (unlike Sprint) really works. ATT GoPhone has really expanded their lineup of high-end phones. I took my Lumia 635 back. I thought the screen on the 520 had much better color saturation and contrast. Plus the 635 seems really narrow and has on-screen buttons, making the "real" size more like 4.3 inches. May try the 635 again in the future though. The Walmart Family Mobile Alcatel One Touch Evolve is NOT available for $29.88, at ANY of their stores,or on line, anywhere in the 50 U.S. If you check online availability and enter ANY zip code, it will tell you that this phone will not work in that zip code. However, at full price ($64.88) that exact phone miraculously will work at exact same zip code. The Walmart site is showing it as available for $29.88 at the Oakland, CA store. Whether it's actually available there, I don't know. It's at my local Walmart which is in one of the 50 US states for $29.88. It's showing up at my local WalMart for $29.88. - is there a 3rd party unlocker for Kyocera phones? - does PTel sell locked or unlocked phones? Unlocking is for GSM phones. Does Kyocera make GSM phones? I don't remember seeing any. For a definitive answer about whether the PTel phones are unlocked, you need to ask PTel. But I believe most of PTel's phone's are locked to T-Mobile as they seem to be refurbished or overstock T-Mobile phones. probably are too. The LG P500 Optimus One was never sold by T-Mobile, I believe it's a non-US model so it's likely unlocked. Kyocera Hydro XTRM is gsm...but it looks like most of their phones are Sprint based. Right, I forgot about that one. I did a Google search and only came up with one unlocker that claimed to be able to unlock the Hydro XTRM and they wanted $67! $79.99 is a good price for the Lumia 635 but if you don't need LTE Cricket has the Lumia 630 for $49.99. The 630 supports HSPA+ 4G but not LTE and is otherwise the same as the 635. Cricket is owned by and now runs on AT&T. One caveat for Cricket is that you cannot just buy the phone via the website. You must also pay for a months service as well. so +$40 min for a smartphone. Doesnt matter if you're on Cricket already but not so good for the rest of us. So it is. That's list price so I've removed the ShipCellDeals Volts from the post. Thanks for letting me know. Thanks, Dennis, for sticking to objective reporting. This includes reporting phones that run on the Sprint network. Which words for some and not others. Just the same as T Mobile works for some, and not others... and the same with ATT, Verizon, etc. Glad you didn't listen to the guy who demanded you not include Sprint-related phones. I agree. The $40 LTE VM phone last week was definitely worth deal of the week. I was looking at the Groupon deal for the Samsung Galaxy S3 which looks like a great deal for prepaid, but if you read the FAQ section, it says it will work post-paid only. Bummer. That's the $149 one, right? A great deal, really. It's a great phone; the only complaint I have about it is minor... the speakers being weak. Of course, the battery life is terrible, but it appears to be bad for all smart phones, as the companies have inexplicably decided that "Thin" is better than a phone that lasts a decent amount of time on a charge. Anyway, it says it is "unlocked". my question is how can it be banned from prepaid usage? Is this related to Verizon 'blacklisting" policies? Before July 17, Verizon did not allow LTE phones like the S III to be used on Verizon Prepaid. They are allowed now. Groupon's description of the phone as for postpaid only is probably based on old information. Currently any phone that works on Verizon postpaid can also be used on the Verizon Prepaid ALLSET plan. LTE phones are still blocked on PagePlus and other Verizon MVNOs. It's easier for me to follow a conversation if you comment using the Name/URL option (leave the URL field blank unless you have a personal site) instead of Anonymous. Not currently. It will work when Verizon starts allowing its MVNOs to activate LTE phones which is supposed to happen by the end of the year, possibly as soon as this month. Dennis, you wrote that LTE's are still blocked on PagePlus and other Verizon MVNO's. Will they worked if they are "flashed"? From what little bit of knowledge I have gathered (which is dangerous for me!) it is my understanding that they can be flashed and then once the LTE is allowed they will work with Verizon/PPlus SIM cards. Is that correct? Flashing is not easy and good flashers charge $40 or more. Flashed phones often have issues with data speeds and non-working MMS. With the expectation that LTE phones will be officially supported on Verizon MVNOs soon I would recomend witing rather than flashing. Verizon S3 Prepaid will not work on Verizon LTE. Verizon block it before they sold it. Radio Shack & Best Buy Keep selling them but will not work on Verizon Prepaid LTE U will only get 3G. Unless Verizon reprogram them. Better off buying Verizon S4 CPO phone . available porting out from boost mobile área any carriers offering port un credit. Free month on PTel for port ins and 60% off first month on PagePlus for port-ins using Kitty Wireless.